​Come and join my calligraphy classes in the riverside village of Mistley. 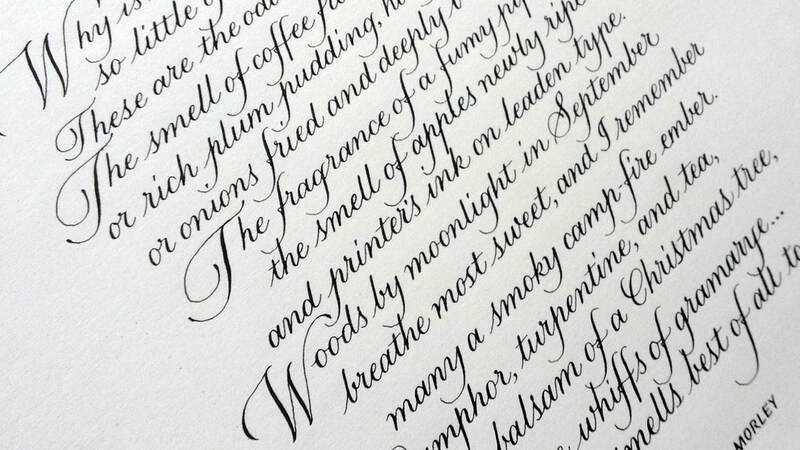 Immerse yourself in the art of beautiful writing - for pleasure, relaxation or study. After a short introduction to calligraphic styles, we will begin with the basics of forming elegant letters using pencil, traditional dip pen and ink. The courses are suited to all levels of learning from absolute beginners to those wishing to improve. A small group (max 7) means you'll enjoy personal and close tuition. There will be demonstrations of lettering and individual guidance to uncover the potential to expand your own ideas with a view to creating a unique piece of work. An array of tools and techniques used will also be explored. All classes are offered individually with no commitment beyond each workshop. Full day classes on Wednesdays can be booked as a block of six or more for a discounted rate. ​Basic calligraphy materials are included and extra supplies will be available to buy. You'll need to bring a few basic items such as pencil, ruler, etc., but I'll provide a list on booking. The venue is a well-lit and peaceful workroom within the Mistley Quay Workshops with a stunning view out over the River Stour. ​There'll be plenty of tea, coffee and biscuits. For our lunch break on Wednesdays, bring something from home or there's a cafe next door. Click here for payment details via PayPal, BACS or by cheque.